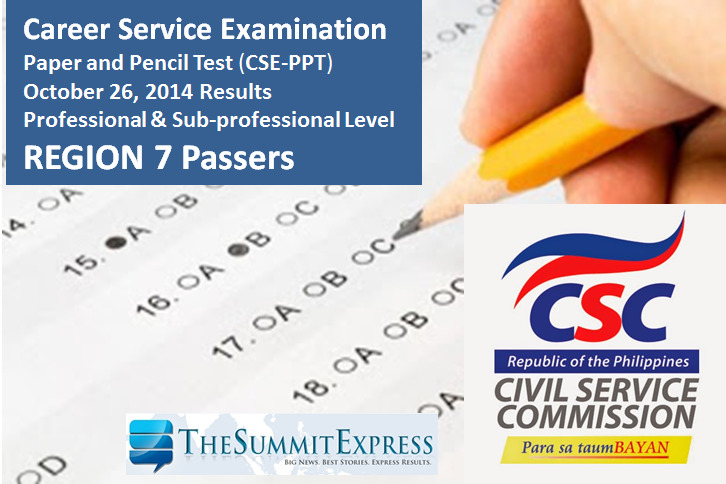 Manila, Philippines - The official results of October 2014 Civil Service Exam- Paper and Pencil Test (CSE-PPT) are finally out online on Tuesday, December 9, 2014. The Civil Service Commission(CSC) has released the list of passers per region for the Professional and Sub-Professional Examinations. Examinees of the October 26, 2014 career service exam in Region 7 (Central Visayas) may now check results on this webpage. More than 170,000 examinees took the Civil Service Examinations in 52 test locations nationwide, according to CSC. 07 283691 ABANIEL, CHARIMAY S.
07 283537 ACAS, MARY MEDIATRIX P.
07 283063 AMAD, BRUSVEEN T.
07 283469 CEBALLO, MA. J-BIE C.
07 283412 DUNGOG, EDWIN V.
07 283816 MABUNAY, NANCY P.
07 282682 MAGLINTE, ELEOMAR P.
07 283302 PANGANIBAN, CHANTELLE PEARL G.
07 283368 RAYMUNDO, REGGIE C.
07 282958 ROBARO, GRACIELLI MARIE C.
07 283602 UY, JULIUS BRYAN I.